MEMPHIS – One win does not make a road trip. At least that’s what the Thunder’s attitude displayed even in the aftermath of Friday night’s high-intensity victory over the Toronto Raptors. On this two-game trip, the final multi-game road swing of the season, the Thunder wants to come back home with two in the win column. In order to do that, the Thunder will have to play with the same type of focused effort that it displayed against the Raptors, yet tooled towards a Grizzlies team that has been pesky all season long, particularly at home, despite not boasting a strong record. At 29-44, Memphis is eliminated from playoff contention, but after some trade deadline deals, has talent on the roster with Jonas Valanciunas and Delon Wright joining Mike Conley as catalysts for the group. Where the Thunder will be most challenged, however, is actually on the offensive end, given that Memphis ranks 2nd in the NBA in points allowed per game and has a defensive rating of 105.6, 9th-best in the league. In order to be efficient and give itself a chance for a second straight win, the Thunder will have to be sharp with the ball. Throughout the course of an NBA season, teams will often have two or three moments where opponents figure out a way to disrupt their offense and its up to the coaches and players to re-tool the puzzle pieces to get it working again. 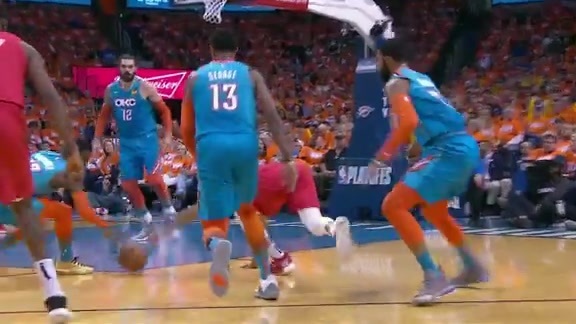 In recent weeks, opponents have been trapping and double-teaming George whenever he has the ball in a pick and roll situation, and while at first it was frustrating, the Thunder has worked through that. As a response, George has simply made the right play by getting off the ball and allowing his teammates to attack a 4-on-3 behind the trap. The key for the Thunder has been making sure everyone is on the same page after George’s escape pass. Crucially, teammates like Terrance Ferguson and Jerami Grant have been open on those quick-hitting passes, and have shown the ability to make the next play from there – to dribble, pass or shoot. Against Toronto on Friday Ferguson and Grant combined to shoot 8-of-15 from three, as a massive counterpunch to the Raptors’ defensive scheme. As it did in Toronto, it will be crucial for the Thunder to execute precisely against Memphis and not get bored with the process of having to manipulate the defense to manufacture the exact look it wants. Over the course of a 48 minute game that can be tedious, but the Thunder knows that if it can expose a crack in the defensive shell, it must chisel away at it until the Grizzlies change up. For the season, the Thunder have played at the fourth-fastest pace in the league, while the Grizzlies rank 30th in that category. In the month of March, however, Memphis has shot up to 21st in that department. While still not pushing the ball with alacrity in transition as much as other teams, the Grizzlies have done a much better job of bogging down opponents, getting stops then getting into its own offense quickly. That’s the formula the Thunder wants to operate out of as well – turning defense into offense like it did on Friday, when it used 22 Toronto turnovers to rack up 16 fast break points. In Memphis, another on-brand Thunder performance on the road could be just the turnaround this team needs heading into the final three weeks of the season before the postseason begins. “There’s more than enough time for us to turn and use this momentum to push us and carry us through,” George said. 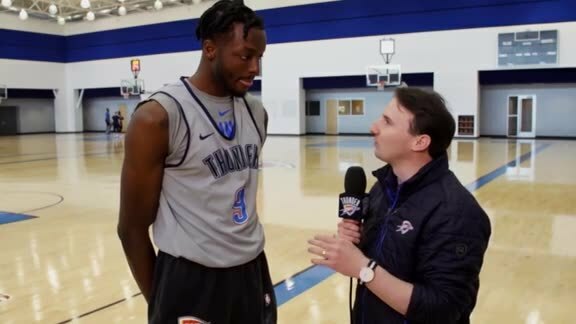 - Besides Andre Roberson, everyone was available for practice for the Thunder on Sunday, including Dennis Schröder who was able to shake off that ankle turn on Friday to compete fully. - This season, a notable change for George aside from his career-best production in the stat sheet has been his vocal leadership. 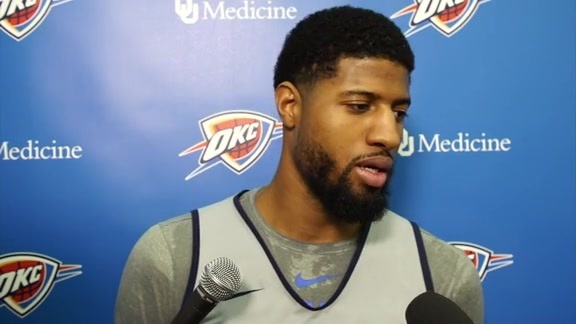 Coach Donovan and George himself have explained that the comfort of being back in Oklahoma City for a second season, understanding his teammates and getting a lay of the land has allowed George more confidence to be a changemaker and a leader. “Coming back here, the moment I decided to come back and make this my future was when I gave that side and was more vocal, took more of a leadership role,” George revealed. 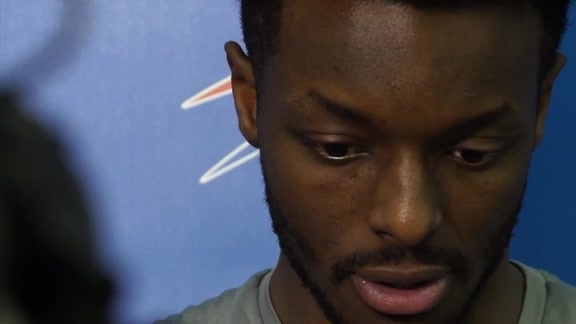 “I know how it is being one voice on a team and sometimes it gets overwhelming to continue throughout the year. That’s pressure that I’m trying to take off of Russ where he knows I’m in it with him. - Throughout the season, Terrance Ferguson’s three-point shooting had risen steadily in each month, hitting a crescendo in January when he shot 47.9 percent from behind the arc. Leading into the All-Star break, opponents started to defend Ferguson differently, sticking tighter to him and forcing him to shoot over an outstretched hand or to put the ball on the floor and make a play. In February he shot 35.2 percent from three, and in March thus far he’s shooting just 28.6 percent, though he’s coming off a nice 3-for-7 performance from behind the arc against Toronto. The key for Ferguson is taking catch-and-shoot when possible, and either through dribble hand offs or other actions, finding ways to keep him in the flow of the offense. “When he gets his feet under him, he’s got such a quick release and he can get it off really fast,” Donovan said. “I think for Ferg, it’s him touching it periodically. Not necessarily handling or to make plays, but just getting a feel for it, being engaged and involved in the offense,” George noted.